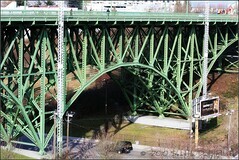 Photo of the Dr. Jose Rizal Bridge by Seattle Daily Photo in the Beacon Hill Blog photo pool on Flickr. Seattle Department of Transportation crews will close the northbound, right lane of the Dr. Jose Rizal Bridge from July 11 to July 29, from 8 a.m. to 3 p.m. each day. The closure will allow crews to perform maintenance work underneath the bridge deck. Be aware that there may be some congestion in the area.